Here’s what’s up in the world of TV for Tuesday, August 21. All times are Eastern. White Collar (USA, 9 p.m.): Look, we understand—we’re busy people, too, and when we get home, the last thing we want to do is watch what some words on a computer screen told us to watch. You’d probably rather enjoy a stroll on one of the last remaining evenings of summer 2012, or cuddle up with a good book, or spend some quality time with a loved one. Oh, who are you kidding? 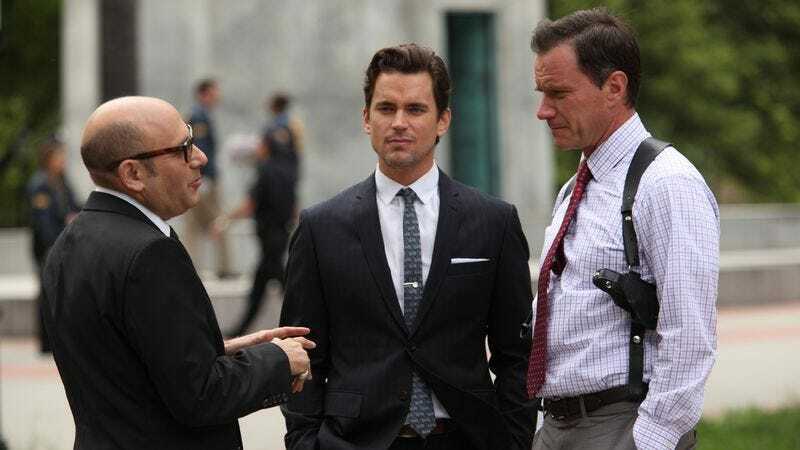 You’ll end up staring at the television, and what better way to spend that time in front of a glowing rectangle than exposing yourself to the myriad charms of Matthew Bomer and his heist-ready wardrobe? Break the summer doldrums and join Kenny Herzog for the well-dressed escapades. The L.A. Complex (The CW, 9 p.m.): This would also be a fine evening to stop breaking Jewel Staite and Cassie Steele’s hearts and start watching The L.A. Complex. And if not for her, do it for Phil Dyess-Nugent. MasterChef (Fox, 9 p.m.): The remaining contestants whip up a meal fit for a president. Phil Dyess-Nugent hopes for a Time Machine Chefs crossover where the presidential diner turns out to be William Howard Taft, America’s hungriest president! Dawson’s Creek (11 a.m.): To show solidarity with the kids of Capeside, Brandon Nowalk will review “The All-Nighter” while hopped up on Mountain Dew and tense conversations with Katie Holmes. Six Feet Under (1 p.m.): Rico and Vanessa unexpectedly strike it rich, and John Teti still can’t believe they didn’t immediately invest the money in backyard water slides and go-karts, like the kid from Blank Check. Home Movies (3 p.m.): Liberated from the shackles of UPN and reborn as part of the original Adult Swim lineup, Home Movies was free to delight late-night TV viewers with rock operas based on the works of Franz Kafka. Erik Adams brushes up on The Metamorphosis in preparation. HGTV Design All Stars (HGTV, 9 p.m.): The inaugural HGTV Design All Star will be the competitor who best transforms a shipping crate into a home. Because the HGTV Design All Stars finalists will be our only hope for comfortable housing after the coming apocalypse. The 2012 Do Something Awards (VH1, 9 p.m.): We typed this sentence—is that enough “something” to win an award, VH1? Oh, you mean a meaningful “something.” Never mind. Craft Wars (TLC, 11 p.m.): Dearest Martha: This damnable Craft War is at an end. Yet I can’t help but thinking the “Blinded By The Light” challenge into which General Spelling is leading us is a trap. If this should be our final correspondence, please bury my body in a coffin of pipe cleaners and pom-pons. Groundhog Day (AMC, 8 p.m.): Because the person responsible for AMC’s “we’re showing Groundhog Day three nights in a row” ad is hilarious, the ad repeated itself three times during the most recent Breaking Bad. Because the person responsible for AMC’s “we’re showing Groundhog Day three days in a row” ad is hilarious, the ad repeated itself three times during the most recent Breaking Bad. Because the person—ha, made you look. Little League World Series: U.S. elimination game (ESPN 2, 8 p.m.): Two emotional scars that will never heal for the losers of this game: They’ve been knocked out of the Little League World Series and their elimination doesn’t rate an acknowledgement from the ESPN mothership, which is airing last year’s Texas A&M-Arkansas football game instead. Bunheads: This is your last chance to make fun of Bunheads’ title until the show returns in early 2013. Erik Adams, meanwhile, will be searching for another show to fulfill his weekly quip quota.